Jordan was my favorite. Of all of the New Kids on the Block, he is the one I swooned over. Their posters covered my walls. 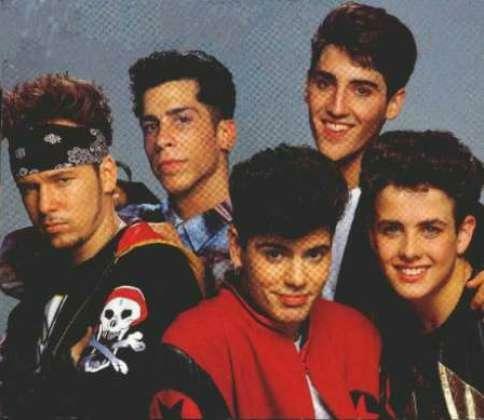 I listened to their tapes and watched their music videos and tried out their dance moves and envisioned one day being Mrs. Jordan Knight. You could say I was a fan. Then, as an adult, I got the chance to see them in person. My sister and I made the trip to the Quicken Loans Arena in Cleveland and for an evening became 12 again. Or at least we did for a few minutes. As NKOTB danced and sang the songs from the late ‘80s, we were giggly 7th graders all over again. But as some newer, sultrier songs began to play, a brood of scantily clad vipers slithered their way to the front of the stage doing some risque dance numbers with my Jordan and the rest of them. Not what I wanted to see. How in the world did Jordan, Joe, Jon, Danny and Donnie, or their managers or choreographers or their bus driver or even these women decide that would be a good idea? Why would I, the former future Mrs. Jordan Knight, want to watch some other girl dancing with him? C’mon, NKOTB – Know your audience! It would have made sense that the team who makes these decisions would have imagined all the 30-something women in the audience and why they were there. It’s important to see the faces of the people you are serving before you decide which direction to go. It’s how Jesus did it. In Mark 10, Jesus had just been teaching a group of people, and spending time with some kids, and as he was leaving, a guy came running up to Jesus asking how he could have the eternal life Jesus teaches of. Jesus ran through the list of commandments, which, as Jesus knew, the guy had been on board with keeping. Then comes my favorite line in verse 21. Jesus saw his face. I can just imagine Him looking into this guys eyes, and thinking of how He really does love this world so much and this man is one of the reasons He was here – to die for him, to spend forever with him in heaven. Only after first seeing him and loving him, He tells him what He needs to do. He tells him to sell everything he has and give it to the poor, then go follow Him. He wanted his total commitment. Jesus knew that was the part this man would need to deal with, the part that was holding him back. We all have had those things – our biggest struggles that threaten our obedience to God. Yours might be different from his, and mine might be different from yours. But we’ve all got ‘em. While Scripture tells us this man went away sad, and kind of leaves it at that, I really hope that he was able fully commit himself to God at some point. It is easy for Christians to feel they need to list all the sins, or at least the ones they don’t struggle with, on social media, while teaching, or in conversation. We do this without thinking of who we are talking to. Once I was teaching middle school Sunday School class and, when talking about sin, I used an example of some “crazy, way far out there sin for middle schoolers” – drug use. I said it so flippantly, which made it come across as something these guys would never deal with, that’s just something really bad kids go through. I wish I hadn’t said it like that. I didn’t know the all the backstories of each kid, and each of their family members. It’s very possible that I made some of them who could be battling this themselves, or who have people close to them who are, seem like a separate group of people from the rest of us. That’s not okay. My sin and my struggles might be different than yours, but they don’t make me better, nor, thankfully, do they make me worse than you. We are all messed up humans who need the grace of God. When speaking to someone about sin, whether writing, teaching, or in conversation, it’s so important to imagine who will be reading or listening – not to avoid teaching about what the Bible says, but to do it with love. When saying or writing the words, if I can imagine it’s my sister or my son or my husband being the one struggling with this same thing, it will make a world of difference in how much love my words are covered with. Instead of Jesus blasting the guy, calling him a money-focused, selfish jerk, he looked at him and loved him. Then He told him the truth he needed to hear, spoken from the face of his Teacher with eyes brimming with love. Let’s follow His perfect example. If someone dear to us comes to us needing some direction from Scripture, we need to do it with love. If it’s someone we don’t know that well, we need to imagine that it is someone we love dearly. Then, and only then, we respond. Love first, speak second. Confession: sometimes I go to the gym and don’t sweat. I meander over to a treadmill, turn on HGTV, plug in my earbuds, and I mosey. That’s right, mosey. While others around me are “getting their workout on,” running, sweating, panting, I am not even out of breath. For the record, it’s not all the time. Sometimes I am super stinky when I am finished, proving to me that I have burned some serious calories. Just days ago, I got sucked into an episode of Buying and Selling where Jonathon and Drew were trying to please one of the most difficult and whiny women in the history of television, and I didn’t know the show was going to last an hour. I was sweaty that day. I figure that any work I do on the treadmill is better than no work, right? I’m doing better than people who aren’t working out at all. Maybe not as good as the sweaty people beside me, but good enough.